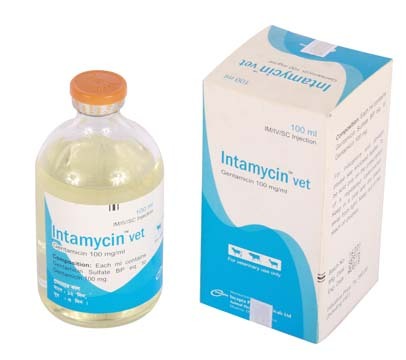 Intamycin vet injection: Each ml contains Gentamicin Sulfate BP equivalent to 100 mg Gentamicin. Gentamicin is a broad-spectrum aminoglycoside antibiotic active against Gram-positive eg. Staphylococci, Streptococci, Corynebacterium spp. and Gram-negative bacteria. It binds with 30S subunit of bacterial ribosome, thereby inhibiting protein synthesis. The benefits of this injection are: bactericidal at low dose, rapid tissue distribution, prolonged activity in major organs, drug of first choice in cases of resistance to other antibiotics as Oxytetracycline, Chloramphenicol, Sulphonamides and significantly reduces early chick and pullet mortality. Cattle, Buffalo, Sheep & Goat: Gentamicin is more effective against Mastitis, Endometritis, Cystitis, Nephritis, Dermatitis, Shipping Fever, Brucellosis, Hemorrhagic Septicemia and various bacterial diseases. To prevent secondary bacterial infection in case of viral diseases (PPR, FMD). Poultry:Gentamicin is more effective against CRD, CCRD, Infectious Coryza, Bacterial Enteritis and Staphylococcosis. For IV or IM or SC Injection. The following doses are preferably to be given twice for 1st day at 12 hours interval and afterwards once daily for 3-5 days. Poultry: 0.05-0.1 ml (5-10 mg) per kg body weight. 1 ml Gentamicin injection mix with 9 ml of distilled water then inject 0.5-1 ml/kg body weight. Or 1 ml/liter drinking water for 4-5 days. Or as directed by the registered Veterinarian. Gentamicin injection is tested and clinically well tolerated antibiotic. However, Hypocalcaemia, Neuromuscular Paralysis, Hypertension, Nephrotoxicity and Ototoxicity may be seen with high dose and prolonged medication. Should not be administered for longer than 7 days. Should not be used in pregnant or lactating animals.